Aparecidos were established by Argentine brothers Facundo and Santiago Moreno, who in 2001 had left their home country and settled in the Italian “prog hub” of Genoa, where they had the opportunity to meet other like-minded musicians. The band’s debut album, titled Lo Que Hay en el Charco, was released in 2009 for independent label Dodicilune. For their sophomore effort, recorded with a slightly different lineup (which includes two members of fellow Genoese band Calomito, guitarist Marco Ravera and bassist Tommaso Rolando), they joined the AltrOck Productions roster – already home to a number of distinguished contemporary acts. 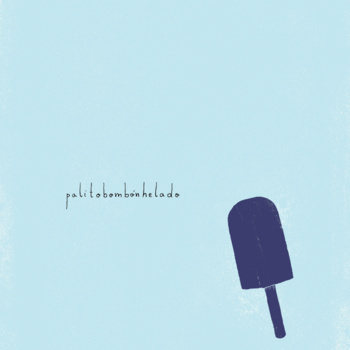 Palito Bombón Helado was released in November 2012, at the tail end of a year characterized by a large number of high-quality releases. Though the album appeared on the market almost at the same time as Mirrors, the highly anticipated live album by AltrOck’s standard-bearers Yugen, it managed to attract the attention of the growing contingent of devotees of the Milan-based label’s output. Indeed, Palito Bombón Helado – whose title and endearingly naïf artwork refer to the ice cream bars on a stick sold in the streets of Buenos Aires at a time when ice was a rarity imported from the US and England – feels like a breath of fresh air, marrying superb musicianship with the bittersweet combination of wistfulness and joie de vivre typical of Argentina’s rich musical tradition, whose mostly European background mingles with African and indigenous influences. In Aparecidos’ musical universe, the folk/acoustic and the electric/rock component coexist in perfect harmony, complementing each other rather than competing for attention. An exquisite flair for melody lends the music a natural flow, making it easy on the ear. The compositions emphasize the ties between Argentina and the rest of the South American continent: “La Cumbia Inglés” draws on a traditional Colombian dance adopted in the Argentine canon, while the prominent presence of the charango (a stringed instrument traditionally made with the shell of an armadillo) anchors the album to the native heritage of the Andean region. The instrument’s distinctive lilting, metallic tone, introduced to European audiences by Chilean bands Inti Illimani and Quilapayún in the Seventies and Eighties, blends with the intricate classical guitar patterns to perfection. Santo Florelli’s drumming, complemented by Manuel Merialdo’s percussion and Tommaso Rolando’s bass and contrabass, evidences a great sense of rhythm, sometimes imparting a solemn, almost grandiose pace to the music. Though Palito Bombón Helado is conceived as an instrumental album, occasional vocal touches add to the overall musical texture – such as the vocalizing (courtesy of Tatiana Zakharova) that enhances the upbeat, march-like pace of “Saracinesca”, or the appealing, Brazilian-tinged warbling at the end of opener “Tanto Gonfio Saremo”. All of the 8 tracks have their distinct personalities, and feature some spectacular musicianship from everyone involved – warm hand percussion underpinning the seamless interplay of the brothers Moreno’s classical guitars, the crystalline tinkle of the glockenspiel, the accordion’s folksy wistfulness that tempers the joyful bounce of much of the music, the violin’s sweeping lyricism. Marco Ravera’s elegantly understated electric guitar connects the music to the rock universe, though without stepping too assertively into the limelight: outstanding examples of its role can be found in the afore-mentioned “La Cumbia Inglés” and in the hauntingly beautiful closing track “Peperina en el Semaforo”. Mattia Tommasini’s violin comes into its own in the subdued “Zamba del Chaparrón”, based on Argentina’s national dance, showcasing the effortless nature of the instrumental interplay, with perfect balance between the electric exertions of Ravera’s guitar and the acoustic instruments, and a brief foray into Avant territory towards the end, with drums, accordion and guitar playing in a sort of skewed slo-mo pattern. On the other hand, the short “Impro” is just what the title implies, with a snippet of the iconic “’O Sole Mio” paying a humorious homage to the Italian tradition. As delightful and refreshing as the delicacy it is named after, Palito Bombón Helado (mastered by renowned sound engineer Udi Koomran) is stylishly eclectic combination of world music, European folk and jazz with a pinch of Avant-Progressive spice, whose complexity is not immediately apparent, and never contrived. Those who appreciate the work of artists such as Cédric Vuille (his 3 Mice project with Thinking Plague’s Dave Willey and Elaine Di Falco comes to mind) or the late Lars Hollmer will find this album a very rewarding proposition, and even the more “conservative” prog listeners will find a lot to like in these 40 minutes of music, even if they do not reflect the conventional features of the genre. In any case, this is another excellent release from the ever-reliable AltrOck label, which in the past few years has become a byword for music whose uniqueness will please those who are increasingly frustrated by the formulaic nature of so much modern prog. The release of With Floury Hand (English translation of the Swedish Med Mjölad Hand) in the summer of 2012 – three and a half years after Lars Hollmer’s untimely passing on Christmas Day, 2008 – came as a boon to all the devoted followers of the influential Swedish artist who had still not come to terms with his demise. The presence of a 72-minute DVD, capturing Hollmer on stage on two different occasions, both in 2005, makes the album an even more valuable document of the creativity of a musician who, in the almost forty years of his career, managed to carve a niche for himself even when playing music that never pandered to commercial trends. The album’s quirky title, derived from a recipe that Hollmer’s daughter was reading aloud during a family dinner in 2007, highlights the artist’s keen sense of humour, always a prominent feature of his musical output. As pointed out by its bracketed subtitle, With Floury Hand is a collection of sketches – 26 short tracks (the longest clocking in at slightly over 4 minutes), belonging to different periods of Hollmer’s career, some of them still in a draft state, which showcase the artist’s zest for inventive, boundary-pushing music-making. As both the CD and the DVD poignantly illustrate, Hollmer’s creative spark was clearly far from being extinguished: indeed, unlike in the case of many of his contemporaries, his wide-ranging inspiration and brilliantly eclectic vein had not been dimmed by the passing years. A year or so after his father’s passing, when the worst of the grief had run its course, Hollmer’s son Gabriel started to delve into the extensive archives that the artist himself had been exploring when, in May 2008, he was diagnosed with the advanced-stage lung cancer that took his life a few months later. The result of this not always comfortable, yet ultimately cathartic process was released three years later thanks to the intervention of Steve Feigenbaum of Cuneiform Records, who helped Gabriel give shape to the project. Some of the material that Hollmer had intended for the follow-up to 2007’s somber, subdued Viandra – an album that was to have a very different tone, reflecting the more upbeat, whimsical side of the artist’s creativity – has been included on With Floury Hand. As Gabriel explains in his thorough liner notes, the album as a whole blends finished and unfinished material, experimentation and tradition, melody and endearing silliness – summing up Hollmer’s artistic personality in under an hour’s running time. With Floury Hand is introduced by the bracing tune of “Beat Mm”, a jam built around a sequencer theme that Hollmer had conceived as a “car song”. Jaunty, folksy accordion showcases such as “Siska” or the infectious, circus-like “Tivolimarsch” alternate with more sedate, gently melancholy pieces reminiscent of another master of the instrument, Argentinian composer Astor Piazzolla – such as the melancholy “Tages”, “Nyfin” or “Vendelvarianter”. The warm tone of the accordion is often complemented by neat percussion patterns, while the liberal use of electronics introduces modernity in a traditional context. Nods to Hollmer’s role as one of the founders of the RIO movement appear in the more left-field offerings, such as “Den Arga Kvinnan” (The Angry Woman”), with its clashing sounds, the eerie electronics of “Radioyl” , and the multilayered, synth-driven “Mellan Stol Och Bord”. The few tracks that feature vocals reveal Hollmer’s playful side, like the ‘fake German lied’ of “Tyskromans”, or the ‘stupid and funny’ “Kanske”. On the other hand, the very aptly-titled “Aningar” (Premonitions” exemplifies Hollmer’s darker vein, its menacing. cinematic pace hinting at Univers Zéro; while “Go to Africa”, as the title implies, is a vocal jam over a steady arpeggiator beat that pays homage to the African musical tradition. Finally, the exhilarating “Okjak” – a fine specimen of ‘happy’ RIO/Avant composition – sees Hollmer flanked by his former Von Zamla bandmate Eino Haapala on guitar. The two performances featured on the DVD, while quite different from each other, will delight Hollmer’s fans in equal measure. The first half shows Hollmer on stage at the Gouveia Art Rock Festival – first on his own, accompanied only by his faithful accordion and melodica, then by his friend and longtime collaborator Michel Berckmans (of Univers Zéro fame) on bassoon, and finally with Miriodor, for a stunning rendition of “Talrika” (featured on the French Canadian band’s 2005 album Parade, and whose original version appears on the CD). In the second half of the DVD, the artist is captured in the small, intimate setting of Swiss club Heuwiesse, performing as a duo with Swiss accordionist Fizzè. 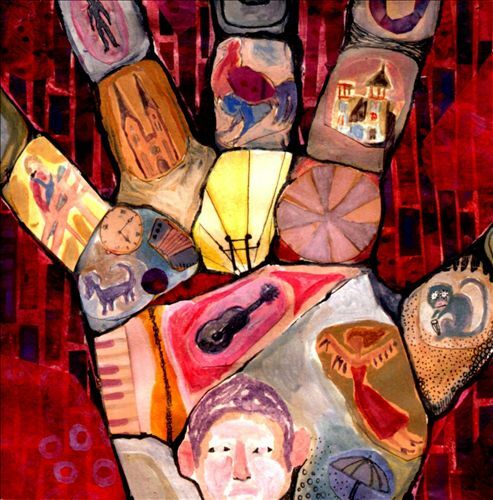 With its colourful cover artwork (by Hollmer’s daughter Rinda) and heartfelt liner notes, With Floury Hand is a touching homage to a gifted artist who never compromised his integrity, and who would have continued to produce great music if fate had not decreed otherwise. The album is obviously recommended to fans of the original RIO/Avant movement, as well as European folk; however, it can be enjoyed by anyone who is interested in quality rather than labels or tags. In spite of their name (Latin for “fake music”, referring to the use of notes lying outside the “true music” system as established by Guido D’Arezzo), there is nothing fake or contrived about Musica Ficta, an Israeli six-piece formed in 2003 by guitarist and composer Udi Horev. Their debut album, A Child & A Well (English translation of the Hebrew Yeled Vebeer) was originally recorded in 2005, but only released on the international market in 2012, on the Fading Records subdivision of AltrOck Productions – thanks to renowned sound engineer Udi Koomran’s close relationship with the cutting-edge Italian label. Koomran, who mastered the album, also guests on one track; while Paolo “Ske” Botta is responsible for the stylish graphics. Musica Ficta are a supergroup of sorts, featuring the considerable talents of Russian-born jazz singer Julia Feldman and flutist/composer Dvir Katz, known on the jazz scene as the leader of Chameleon Trio. The other band members (original keyboardist Yuri Tulchinsky was replaced by Omer Rizi just after the recording of the album) are also obviously very talented, and well-versed in a wide range of musical modes besides rock. This should not come as news to anyone familiar with the small but thriving Israeli progressive music scene, which last year produced one of the classiest “retro-prog” albums of 2011, Sanhedrin’s Ever After, and can boast of a strikingly original prog metal band such as Orphaned Land. True to the multiethnic nature of their home country, Musica Ficta infuse their sound with influences that go beyond classic prog. The use of Hebrew for the lyrics (though all of the song titles are in English) adds an exotic touch to the music, whose heady blend of lyricism ad heaviness contains suggestions of medieval and Renaissance music, and tantalizing hints of Eastern European and Middle Eastern folk music (particularly evident in the title-track). 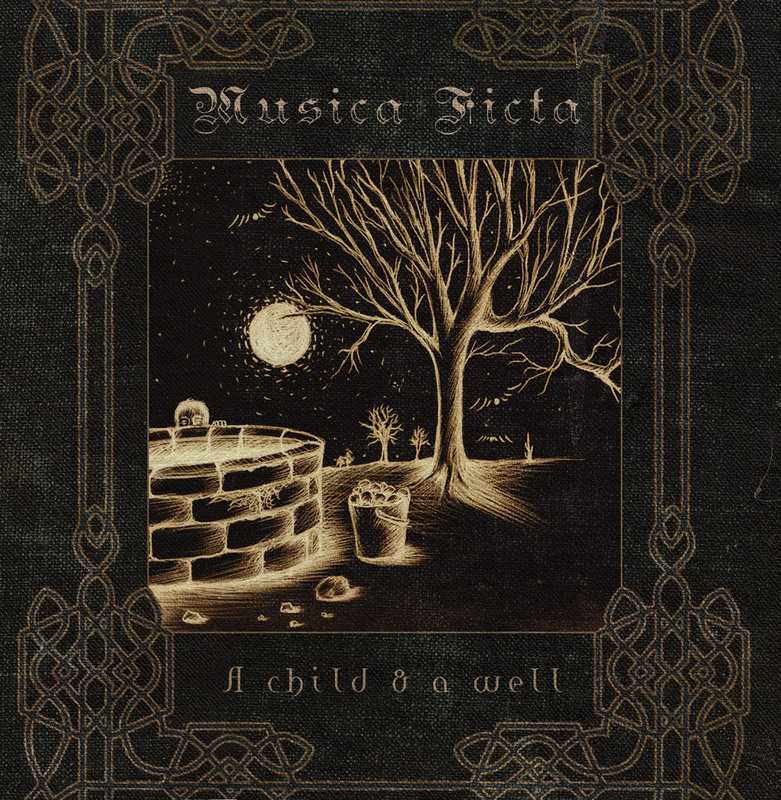 With those characteristics, further enhanced by the presence of a strong female vocalist, Musica Ficta may draw comparisons to Ciccada, a band whose debut album (bearing the uncannily similar title of A Child in the Mirror) was the first Fading Records release. In keeping with a praiseworthy trend for shorter, more compact albums, A Child & A Well clocks in at a healthy 45 minutes, with relatively short tracks (the longest, the instrumental “A Fantasy”, is under 9 minutes) that nevertheless offer all the complexity and lush instrumentation that a self-respecting prog fan might desire. Most of the compositions feature Julia Feldman’s confident, highly trained voice, as capable of hitting the high notes as of reaching for deeper, more subdued tones. For some odd reason, however, her voice failed to resonate with me – especially in the album’s attempt at a power ballad of sorts, the slightly sappy “Little Town”, which is rescued by its Genesis-meets-PFM finale. Personal gripes aside, Feldman’s performance will not fail to impress fans of commanding female vocalists such as Annie Haslam or Christina Booth. The title-track (which can be also enjoyed as a video, with the band dressed in 18th-century costume) is probably Feldman’s finest hour on this album, the lilting, dance-like pace of the singing offset by the harder-edged instrumental sections, driven by organ and guitar. The central role of the flute in A Child & A Well has elicited inevitable comparisons with Jethro Tull, compounded by the often aggressive stance of the electric guitar – and, indeed, Udi Horev’s approach owes a lot to Martin Barre’s hard-driving style. “Man & Angel” rests on the balance between gentler, vocal-based passages and heavier instrumental ones that characterizes much of the output of Ian Anderson’s band; the same dynamics of folk-ballad-meets-hard-rock can be found in the intense “The Postman”. Indeed, However, there are also nods to lesser-known outfits like Delirium (in my view, one of the best early Italian prog bands), whose influence emerges in the jazzy, bass-driven instrumental “Run Free You Idiot” – an intriguing concoction of Avant suggestions, razor-sharp guitar riffs and lilting harpsichord that is definitely one of the highlights of the whole album. My personal pick, however, would be the 8-minute-plus “A Fantasy” – a stately, supremely atmospheric guitar showcase, acoustic at first, then electric, complemented by the eerily surging drone of Koomran’s haunting electronic soundscapes. A Child & A Well is a superbly performed album that,while not perfect (I personally found the second half more satisfactory than the first), has the potential to appeal to most progressive rock fans, even those more inclined towards cutting-edge stuff rather than anything with a “retro” flavour. Unfortunately, Musica Ficta seem to have dropped off the radar in the past few years, with its members engaged in other projects. It is to be hoped that they will surface again in the near future, because their debut surely shows a lot of promise. Love or hate the Internet, there is no doubt that without its existence an album such as Send Me a Postcard would have never seen the light of day – much to the detriment of the contemporary non-mainstream music scene. 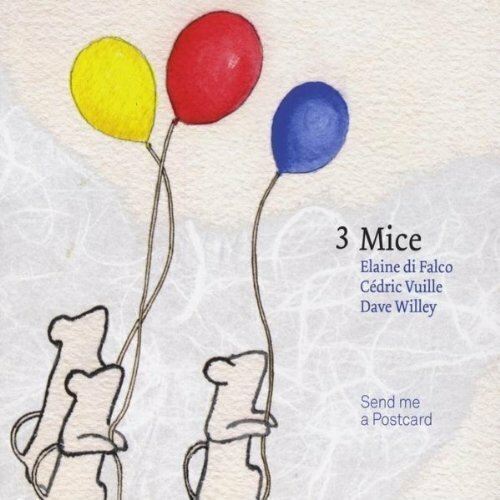 In fact, the three artists who have adopted the quaintly endearing name of 3 Mice reside at opposite ends of the world – Cédric Vuille (of Débile Menthol and L’Ensemble Rayé fame) in Switzerland, Dave Willey and Elaine DiFalco (both members of Thinking Plague, Willey also Hamster Theatre’s founder and mainman) in Colorado. Israeli sound engineer Udi Koomran (one of the icons of the modern Avant-Prog scene) acted as a catalyst by arranging a meeting between the three artists in 2008, when Thinking Plague performed in Vuille’s home town of Geneva. After finding out that they were kindred spirits in their musical vision, Vuille, DiFalco and Willey started their project by sharing files on the Internet, then drafting in some trusted collaborators (namely L’Ensemble Rayé’s drummer Daniel Spahni and Hamster Theatre’s percussionist Raoul Rossiter, as well as Koomran himself). Send Me a Postcard, lovingly packaged in Elaine DiFalco’s delightful artwork, was finally ready for release at the end of 2011. Clocking in at about 42 minutes, and featuring 12 short tracks (the longest barely above 5 minutes), Send Me a Postcard belongs to the “new generation” of undeniably progressive albums that, however, dispense with most of the trappings of traditional prog – such as epics, orchestral arrangements and somewhat pretentious concepts. Even if the association of the members of 3 Mice with the RIO/Avant scene may prove daunting to those who are more conservatively inclined, the album has more in common with Hamster Theatre’s playful, folksy attitude than Thinking Plague’s austere intensity. Songwriting credits are shared equally between the three artists, who lend them their individual imprint; DiFalco’s compositions are the closest to classic RIO/Avant modes, though with a more informal, laid-back attitude. Unlike Willey’s recent solo album, the outstanding Immeasurable Currents (which has a very similar structure in terms of running time and number of tracks), Send Me a Postcard is mostly instrumental, though DiFalco’s distinctive voice appears on half of the tracks, engaged in lovely wordless vocalization. There is nothing overly serious or academic about 3 Mice’s approach: the overall mood is decidedly upbeat, reflecting the sheer joy of making music that is at the same time complex and accessible. The emphasis is firmly placed on the sleek, seamless instrumental interplay, with the three musicians switching effortlessly from one instrument to the other; the main actors – the accordion, the guitar and the piano – are complemented by an impressive array of exotic percussion and other ethnic instruments. Not surprisingly, being the result of the collaboration between a European artist (belonging to a French-speaking cultural environment) and two American ones, Send Me a Postcard is a quintessentially cosmopolitan effort, merging European folk with Brazilian and Latin suggestions, with classical influences and a hint of intriguing Avant flavour thrown in for good measure. Thanks to Koomran’s peerless mix, every instrument is finely detailed with stunning clarity of sound, and the melodic quotient of each composition is brought to the fore in a remarkably ear-pleasing way. It is also quite intriguing to see how much variety can be packed in a 3-minute song, and how the rich instrumentation creates multilayered textures in spite of the chamber-like nature of the ensemble. “Hot Rod Waltz” opens the album with a bold rock-meets-folk flair – electric guitar, bass and drums beefing up the sound and providing a fine foil for the nostalgic tone of the accordion. As suggested by the title, “Orkneys” taps the rich Celtic folk vein, starting out very much like a traditional reel (though driven by accordion rather than the more customary fiddle), and turning more sedate towards the end. The delicate, intimist tone of “Invitation” and “Tse Tse” and the gently chiming interlude of “20 Heart” are offset by the brisk, infectious pace of the Brazilian-influenced, percussion-heavy “Forro Fuega” and the sprightly Caribbean dance of closing track “Skallaloo”. In the only song featuring lyrics, the quirky tale of “Mr Hamster’s Dilemma”, the refreshing laughter of Udi Koomran’s daughters echoes in the background, complementing the jangly, sunny tone of the guitar. On the other hand, the eerie wail of the theremin adds a faintly disquieting note to “Celleste”, and intensifies the autumnal tone of the piano-led “Year of My Solstice”; while the haunting, effects-laden drone of “Experiment” points to the three artists’ RIO/Avant background. Though quite likely to remain a one-off, Send Me a Postcard is an excellent effort that can be warmly recommended to all lovers of great music, Fans of folk/world music with an ear for quirkiness and subtle complexity will find it especially appealing, though devotees of “traditional” prog’s grandiosely orchestrated textures might find it disappointingly simple for their standards. 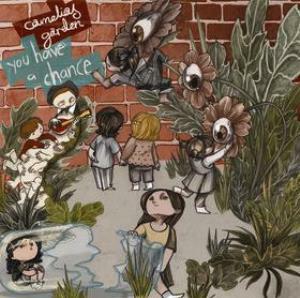 Easy on the ear without being poppy, brimming with lovely melodies and brilliant instrumental performances (not to mention Elaine DiFalco’s gorgeous voice), Send Me a Postcard is a little gem that will reveal its many charms at each listen.